MS students gain a common foundation in ecological science, environmental governance, and integrated assessment via three core courses before specializing in one or more of the following fields of study: Behavior, Education, and Communication, Conservation Ecology, Environmental Informatics, Environmental Justice, Environmental Policy and Planning, Sustainable Systems. Landscape architecture students synthesize information about ecological processes, human behavior, institutions, and urban patterns to create landscapes that work aesthetically, ecologically, socially, and economically. The three-year accredited program is for those new to landscape architecture, and the two-year accredited program is for those who already have an accredited undergraduate degree in landscape architecture or a closely related field. SEAS offers a PhD in Natural Resources and Environment. This research-based curriculum supports the pursuit of either a highly focused course of study or one that broadly addresses complex, interdisciplinary issues. 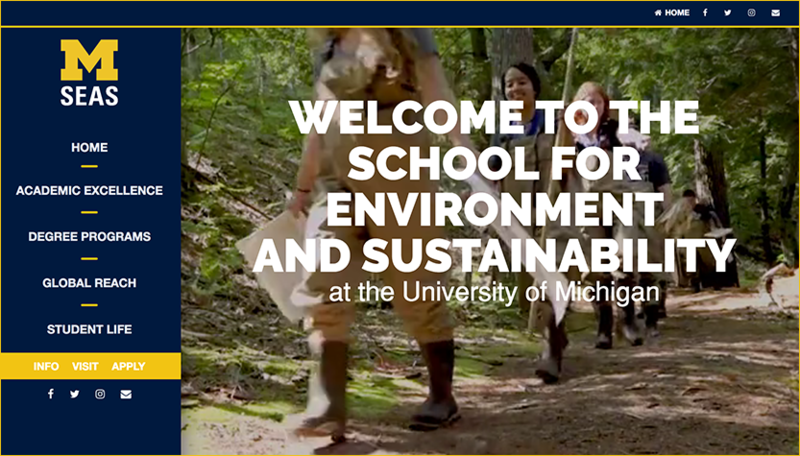 The program has two primary tracks: Resource Ecology Management (with an ecology and science focus) and Resource Policy and Behavior (with a social science focus). Graduate certificate programs allow students to integrate multiple fields of interest and hone a specialized skill set to complement their master's degree. SEAS offers four graduate certificates: Environmental Justice, Industrial Ecology, Spatial Analysis, and Sustainability. The SEAS interdisciplinary focus can be extended even further through the pursuit of a dual-degree. Each natural resources and environment field of study provides an excellent foundation for earning a dual-degree. The school offers formal dual-degree programs with Engineering, Business, Urban Planning, and Law, as well as a multitude of possible self-initiated dual-degrees. Why SEAS? Explore our virtual viewbook. Applications for Fall 2020 will be accepted beginning in September 2019. Check out the Exhibit Page for more information! The faculty of the School for Environment and Sustainability represents the wide range of environmental specialties that comprise the school's comprehensive, interdisciplinary graduate curriculum. SEAS professors are engaged in environment and sustainability research at the highest levels and are personally invested in students' success. Click on any of the profiles below to view details.